Tomorrow's possibilities often come with mixed emotions. On one hand is promise, but on the other can be anxiety. Feelings on the unknown can range from curiosity and optimism to worry and fear. 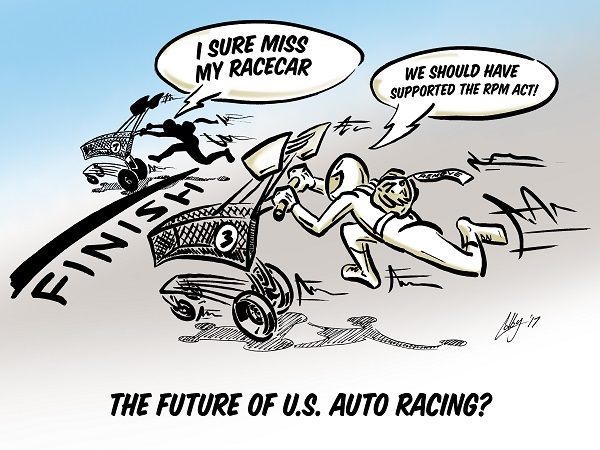 Recently, I've been hearing much more about emerging technical developments within the automotive space reflecting major concerns over how each advancement will ultimately impact the future of our hobby as it has been enjoyed for generations. History has proven that progress won't be stopped. I've heard that Henry Ford believed his Model T offered the ultimate in personal transportation. Sure, the iconic vehicle was a landmark machine - in its day. However, competition by other brands very quickly crowded public roads. Province of Alberta Declares "COLLECTOR CAR APPRECIATION DAY"
A major focus for Jim Weicherding's energy has been devoted to his cartoon character, Buckleupallofus, a clever play on the phrase "Buckle Up All Of Us!" The children's traffic safety mascot appears as a giant inflatable balloon at classic auto shows, drag racing events and race tracks throughout the summer "car show season." This creative reminder to "Boost Up! and Buckle Up!" has been winning fans and awards across New England and New York state. "I want to keep the classic car culture alive and well for years to come by getting kids involved," explains Jim Weicherding. His concern for the hobby's well-being in future generations is evident in his work. "I love classic muscle cars and have been passionate about them since I was a young kid." He considers himself a Pontiac GTO enthusiast. This passion for automobiles ultimately lead him to becoming involved with the SEMA Action Network (SAN). Jim has been building a creative presence in the automotive community for 20 years. Much of his effort has been dedicated to teaching traffic safety to children at car shows, as well as a paperback book and companion feature series. He is a firm believer in the message "Take a Kid to a Car Show." Jim explains that his promotion includes nearly 200 events annually. "My safety campaign reaches tens-of-thousands by passing out coloring posters, fridge magnets and stickers," he says. In contrast to his youthful cartoon character, Buckleupallofus (pictured above), Weicherding has also written a paperback book entitled Outlaw Run. "This fictional story is about the government banning classic cars and trucks from America's roadways," he notes. "In the plot, driving a classic vehicle is now illegal across the USA." The storyline is about one man, behind the wheel of his beloved Pontiac GTO, who refuses to park his classic muscle car forever by standing up against the new law. The book's reviews and Jim's media appearances have helped it grow in popularity, with supporters that include the Under The Hood radio show and Car Show Nationals. "A horror story like this happening to automotive enthusiasts is the last thing any of us would ever want to see become a reality! Without aggressive legislative efforts, this premise could happen in the not-so-distant-future. I like to say, 'Buckle up - this is one helluva ride!'" Learn more about his story: www.buckleupallofus.com/jim-weicherding. We're pleased that your work has received such favorable response, Jim! May you have continued triumphs on your creative journey.